Thanks to Tom Topham, cook for Shift 3 at the Natick Fire Department for the inspiration for this recipe. 4 large baking potatoes, scrubbed. Preheat the oven to 375. Stab at the potatoes a few times with a fork to keep them from exploding in the oven and bake the potatoes for an hour. Potatoes are done when the fork sinks easily in through the skin. Bring the spuds out of the oven (leave the oven on), and slice them in half lengthwise (cool for a few minutes if necessary, or use an oven mitt so you can handle them). Use a spoon to scoop the potato out of the skins (careful not to damage the skins). Put the scooped-out potato in a bowl. Add the butter and mash with your fork or masher until you get to the consistency you like (you can beat them if you like fluffy potatoes). 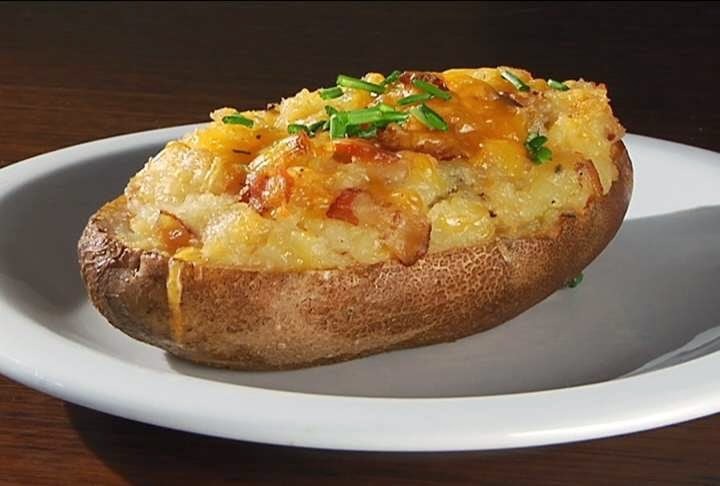 Stir in the cheddar cheese (reserve 1 cup of the cheese), the bacon, the scallions/chives, and salt and pepper to taste; Spoon this mashed potato mixture back into the potato skins on the baking tray, top with the reserved cheddar, and bake for 15 minutes or until golden.